When I sat down to American Ninja, or as I’m going to refer to it, Call of Dudi, I had no idea I’d be treated to a Canon film. They’re one of those oddball production houses that ultimately ended up releasing a bunch of cheap, weird movies, most of which are at least fun, passionately made duds. They made that Masters of the Universe movie we all remember… fondly, so I knew what to expect here as soon as I saw that logo, which allowed me to have some fun with this. Dudi (Michael Dudikoff) stars as Joe Armstrong, an American soldier with amnesia who enlisted as a final plea in a murder case (I think – these details are all pretty fuzzy) who finds himself in a sticky situation at his new base – while trying to save his CO’s gorgeous daughter from Ninja thugs from a Ninja School run by international drug runners, his unit loses four men in the ensuing battle and blames it on him. But no worries! That’s just the full 3-act plot structure of act 1! That’s all resolved when Dudi fist fights the unit’s resident badass, Steve James, finally earning him the unit’s respect, somehow. Then we really get into the movie, which is about… everyone in the movie other than Dudi and James conspiring to steal a rocket launcher and one, single rocket? Pretty sure those are all the necessary details. If you’re wondering how we got from Ninja School to rocket launcher – he never fights through the Ninja School they spend so much time setting up – what should be the big finale set piece is replaced by one single explosion. Dudi is perfect for this non-role. He can’t express himself in any meaningful way, which fits the convoluted, Bourne-like premise of his amnesiac hero perfectly. He literally has no reactions to receiving punches, throwing high kicks, or people he cares for being put in danger. His only reaction to anything is to punch it, and with very little finesse. Thankfully his anti-charisma is balanced out by Steve James, a one-man army who contains the charisma of 37 community theater leads. He has so much chemistry with himself it actually appears as though Dudi is acting when they’re on screen together, even though James is the only one attempting what one might call acting. They make for a fascinating duo, one that actually deserves more screen time than this movie gives them. That’s actually what hurts this movie the most – it’s just boring for long periods of time. It’s everything a cheap 80’s action movie should be, but Dudi just doesn’t Dudi it for me; he’s hard to spend long periods of time with when James isn’t there to pretend he’s in a Rambo movie. But, then again, as a cheap 80’s action movie, this does pretty much have everything – Judie Aronson as a babely heroine who can take care of herself but it’s the 80’s so she can’t; martial arts battles that are mostly just people tossing each other through breakaway tables; multi-national villains that inexplicably have a gang of Ninjas at their disposal; poorly edited action sequences with lots of sparks and smoke that serve as explosions; insane finale escalations like Ninja’s suddenly having lasers. And it takes its cheap filming locale (the Phillipines, I believe) and really makes the most of it – there are some legitimately great shots in this that use the locale beautifully. What I mean to say is – this is one of those movies that is made with so much passion, as if the content of the material was of no concern, only that they had content and displayed it well, that the end product itself is bursting with creativity and zeal for the art form. There are some great, truly hilarious sequences throughout this, complete with weird little mistakes and odd technical choices, but no one can blame you if you find yourself periodically bored. At only 97 minutes, it ultimately feels like it’s a 2-hour movie. Perhaps it would hold up a bit better in a group setting. I will say the film looks great on the Olive Films release – really crisp on my TV while still retaining some of that grain that I love so much. For a movie with the tagline “The deadliest art of the Orient is now in the hands of an American” (I believe they changed Orient to East on this Blu-ray release, good on ya for that, at least) this is a pretty tame, ultimately light bit of 80’s cheese that I recommend if that’s your sort of thing. Watched as a double bill with the original, this started fading from my memory before I even hit the 45 minute mark. I’m not sure I could even do a plot recap in any meaningful way, though that could be due to the film’s own convoluted nature than my memory of it – likely, they’re contributing to one another. To my best recollection, Dudi and Steve James have been promoted to Army Rangers and sent to an American Embassy in the Caribbean to investigate the disappearance of some Marines, which leads to the discovery of a Super Ninja program that must be stopped. Not a bad premise, really. 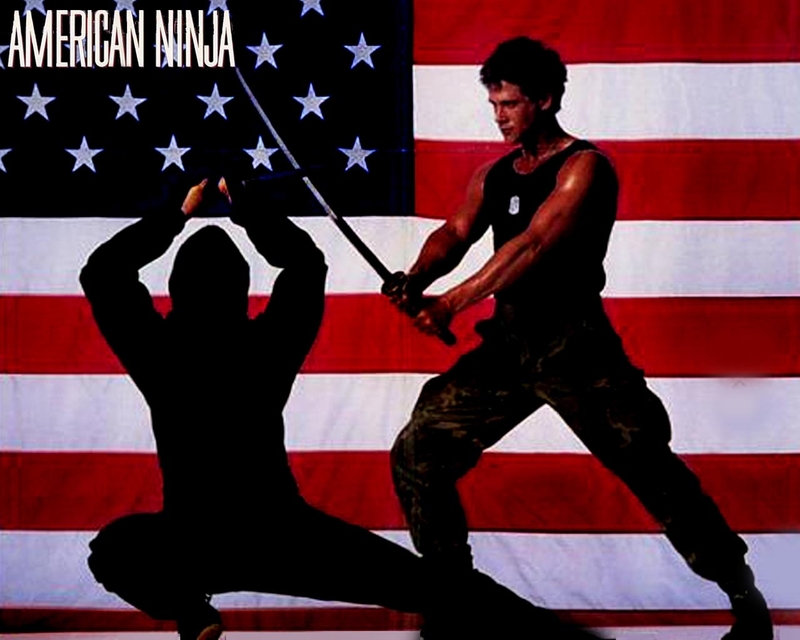 In the beginning of this I was very hopeful – it almost seemed like they had learned lessons from the first American Ninja and knew where to course-correct – this initially plays up a comedic tone that the first only had by accident, and it introduces Dudi and James together, as a team, which is when these movies are at their best. But it’s not long before they once again split that team up and get into long, boring tangents that only loosely play into the larger plot. And if you’ll recall, the most disappointing thing about the original is that they introduce a Ninja School, only to never have Dudi face off with the school of Ninjas. Here, they introduce the concept of Super Ninjas, and then never explore it or do anything with it. Presumably, all the Ninja you see in the film are Super Ninjas, or at least the ones Dudi fights at the end are – but there’s not a single, identifiable trait of the Super Ninja. Their fighting abilities and skills seem to be identical to that of all the other Ninja we’ve seen prior in this series. In fact, at the end of the original, one of the Ninjas uses a laser – the supposedly “Super” Ninjas in the sequel never even come close to those levels of superiority or insanity. Why do these movies insist on name-dropping cool ideas only to abandon them? Complaints aside, their CO in the Caribbean is named Wild Bill and wears a Hawaiian shirt, dons a silly mustache and is a genuinely, hilariously, terrible actor. What I mean to say is this too is a Canon film – it does a lot with a little, it’s got some great shots and sequences that are equal parts well-crafted and dumb, and it has a handful of truly memorable moments. But it’s pretty hard to abide a sequel that espouses to be bigger than the original (Super Ninja! ), but ends up being almost identical by way of disappointing, missed opportunities (Where are all the Super Ninja!?). And like the first, it feels way longer than it is. Alright, so, complaints back inside, then, I guess. Ya know, that actually brings up a very important question – is “inside” the inverse of “aside”? How does that work exactly? “Aside”, as I used it, doesn’t seem to really have a true antonym. Honestly, I’m gonna give this movie an extra star for being so lackluster it turned my brain inside out.